DBK were extremely pleased to be shortlisted for the 2017 BDMA Innovation Award following our submission of the Drymatic Boost Bar into the award category. Drymatic Boost Bar is the next generation of targeted heat drying technology from DBK, giving water damage professionals a safe, reliable, and energy-efficient way of utilising heat within the drying environment. Unfortunately DBK were beaten to the award by the well-deserved winner, Aviva Insurance. InClean Magazine – November/December 2015, page 10. 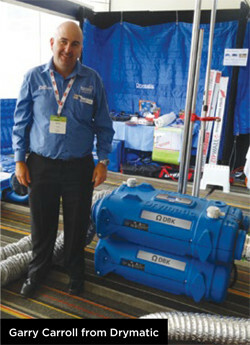 AUSCLEAN Pulire 2015, held 20 and 21 October at Jupiters Casino on the Gold Coast, was a stand-out show with the atmosphere alone creating the perfect networking environment. Exhibitors and visitors alike appreciated the open-plan floor space, barista coffee cart, the business lounges for client meetings, the networking drinks after day one of the show and of course the delicious complimentary canapés that kept everyone well-fed for morning tea, lunch and afternoon tea across both days. On a busy day one of the show, INCLEAN editor Kim Taranto accompanied guest judges John Taylor from The Cleaning Supply shop and Kevin Schilling from Lynch’s Cleaning Service and board member of the Building Service Contractors Association of Australia (BSCAA) Qld division, to judge the INCLEAN Innovation Awards. Criteria for the Innovation Awards are that the nominated product should be ‘evolutionary’ in terms of delivering improved performance, on-site productivity, safety and/or environmental sustainability; and the last requirement is that it is readily available in the Australian marketplace. The judges visited each nominated product at its stand to select the winner of each category – cleaning agents; equipment; services and technology; and janitorial. There were no entries into the paper and dispensing category this year. The judges deliberated for four hours, having to revisit particular stands as they found it difficult to select an overall winner from the successful category victors. 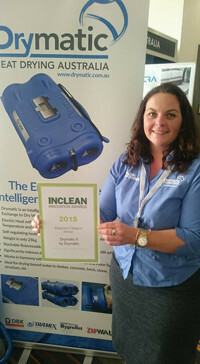 The 2015 INCLEAN Innovation Award was presented to Willie Erken for the Wagtail Water Fed Cleaning System, comprising of two water fed pivot action tools for ease and speed in cleaning windows. “The water-fed precision squeegee cleans to the edge of the window without the need for detailing,” explained Willie. It was this small design change that grabbed the judges’ attention. With our industry taking leaps and bounds in I.T. software advancements and robotic machinery, it is sometimes the smallest of innovations that makes the cleaners’ job easier and Willie’s precision squeegee is testament to that. InClean Magazine – November/December 2015, page 68. The Drymatic System efficiently extracts moisture from properties using controlled heat and air exchange. The lightweight and portable Drymatic II structural heat drying machine features two modes. In Recirculation Mode the area is continuously heated up until either a temperature or humidity limit is reached. In Exhaust Mode, the warm, humid, air is exchanged with warm, dry replenishment air. The Drymatic II can cycle between these modes to maximise the amount of water removed from the area.